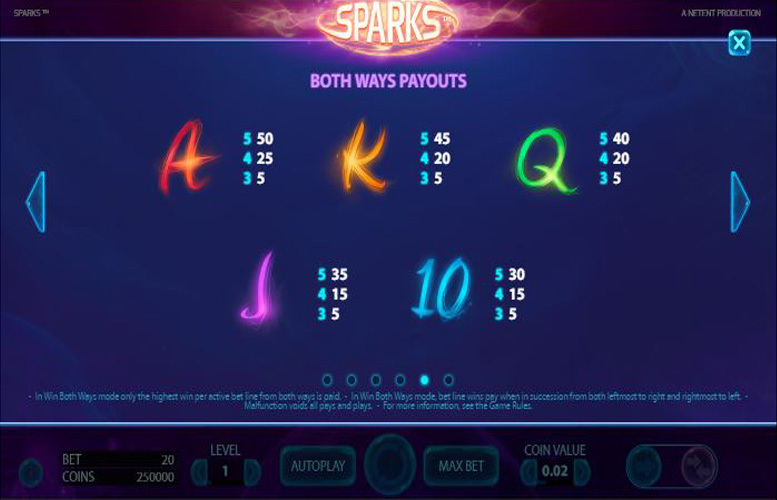 Sparks is a five reel and three row slot game which offers players the choice of either one way payline wins or a win both ways feature. That choice determines whether the game’s theoretical return to player percentage is 96.56% or 96.54% and players can also select their bet level and coin value. Other special features of Sparks include Wild substitutions and an innovative ‘Expanding Cloning Wild’ to add extra excitement. 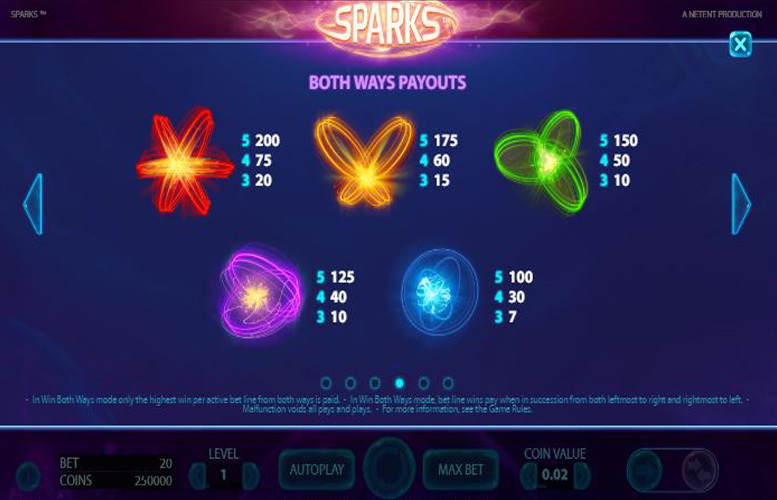 Offering an interesting win both ways option, Sparks is an innovative and exciting slot game alternative. Our review has taken a closer look at the game and most especially at the highest available jackpots, the special symbols, the paytable and players’ betting options. Whether a player chooses to play Sparks in the traditional manner or with the win both ways feature activated, the most valuable symbol in the game is the red spark symbol. If five of those line up along a payline, the player will receive a jackpot worth 200 times their chosen bet level. At the highest possible bet level of ten, therefore, that equates to a payout equalling 2000 coins per payline and 40,000 coins in total,if the combination covers all 20 paylines. With win both ways activated, however, there are 40 rather than 20 ways to win and as such, the top jackpot is actually worth double that – at 80,000 coins. This is a really significant top payout, furthermore, as at the maximum coin value of £2 it is worth a total of £160,000. Whilst the top jackpot of Sparks is undoubtedly impressive, the slot’s gameplay is quite simple. To bear that out, the game actually only features two special symbols, both of which are variants of Wilds. Wild Symbol – one of the Sparks Wild symbols is a traditional wild that can appear on any reel and which substitutes for all symbols other than the second type of wild. That second type is known as an ‘Expanding Cloning Wild’, substitutes for all other symbols and can appear on only reels two and four. If and when ‘Expanding Cloning Wilds’ do appear, they either stay the same, expand up, expand down or expand in both directions. After that, they then clone the adjacent symbols to their left and place the clones to their right in place of the symbols which appeared there after the initial spin. If ‘Expanding Cloning Wilds’ appear concurrently on reels two and four and cover the same rows, therefore, this will automatically produce at least one five symbol payline combination. The majority of the Sparks symbols depict gyroscopic-style spark images, and the most valuable symbol of all is the red spark symbol. Five of those symbols lining up along a payline returns a coin win to players worth 200 times their chosen bet level. At bet level ten that means a return of 2000 coins per payline or of 4000 per payline if the win both ways feature is active. Were that most valuable combination to appear on all 20 paylines, therefore, that would mean a total return of 40,000 coins or 80,000 coins depending upon which game mode is being played. The second most valuable symbol in the game is the orange spark symbol and five of those in combination return winnings worth 175 times the bet level. As well as being able to choose whether they want to play with one way paylines or lines which allow them to win both ways, players can also control the coin value and bet level applied to each spin. Bet level determines how many coins are wagered per payline and coin value dictates what each of those coins is worth. Players can chose a bet level from 1-10 and between eight separate coin values between 1p and £2, meaning that the minimum possible overall stake equals just 20p and the maximum possible is the much larger £400. These totals are determined by multiplying the minimum or maximum bet levels and coin values by the number of paylines (20). 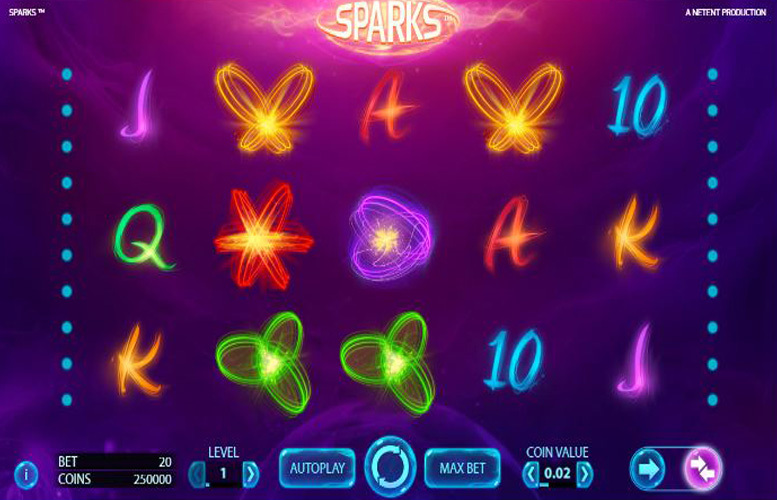 Sparks is an interesting five reel slot which has clear strengths and weaknesses when compared with the other slot games which are available. On the positive side, the game’s win both ways feature is an innovative and fun one, which also helps to increase the overall top payouts that any player can achieve. Thanks to the high maximum coin value of £2 too, the currency level of that top jackpot – being a potential £160,000 – is comparatively generous. In the same vein, the fact that the game offers a total of eight different coin values also gives players better control over their stake amount than is afforded by many other games. On the other hand, however, Sparks does not compare favourably with other slots when it comes to extra features and bonus elements. 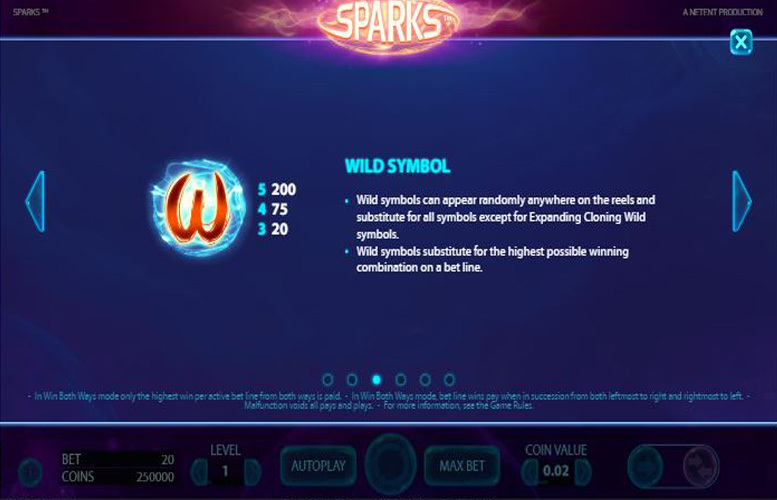 There is no bonus game built in to the slot, no free spins or re-spins are offered and the only special symbols in Sparks are two different versions of Wilds. On the whole, then, Sparks can be summed up as a slot with great betting options and impressive jackpots but little by the way of innovative or exciting gameplay. This game has a rating of 4 / 5 with 611 total reviews by the users.